Chitty Chitty Bang Bang was our main theatre outing during the Christmas holidays however we just about managed to squeeze in another trip with last minute tickets to the Royal Exchange Theatre in Manchester and Sweet Charity. This is one of my favourite ever theatres – the most beautiful Grade 2 listed building right in the city centre. Inside there is a lovely book shop, a buzzing atmosphere with lots of little bar areas and food places but best of all a theatre in the round. We managed to get seats on the ground level, always our choice but I don’t think there is a bad view anywhere here. It feels small and intimate, although over the three levels it seats 700 people. I wasn’t familiar with Sweet Charity, it was coming to the Royal Exchange that was the draw for me. We have been the last three years at Christmas time to see Into The Woods, A Rats’ Tale and my absolute favourite Little Shop of Horrors. Fair to say not much could have topped that and this show did not, however we enjoyed it and it was a fun afternoon. A comedy musical following the story of Charity Valentine, on the lookout for love in New York, there was a sprinkling of well known songs and some great tunes which had everyone tapping their toes. The set was minimalist and I loved (as always) the scene changes and the movement of the actors around and through the audience. Afterwards something different in a different part of the city at the old London Road Fire Station. Son was meeting some friends for ice skating at the aptly named Winter Gathering. Not sure what to expect we were enchanted by this place, a fabulous courtyard full of twinkling lights and dominated by that wonderful ice rink. Son got stuck in, we watched for a little while and then explored. 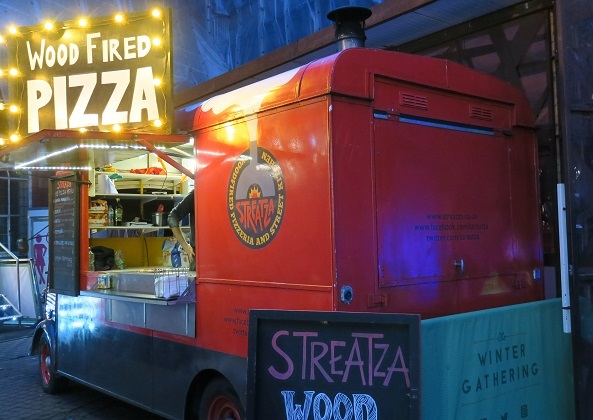 Food offerings were just mouth-watering, there were great vans and stalls selling all manner of delicious things. 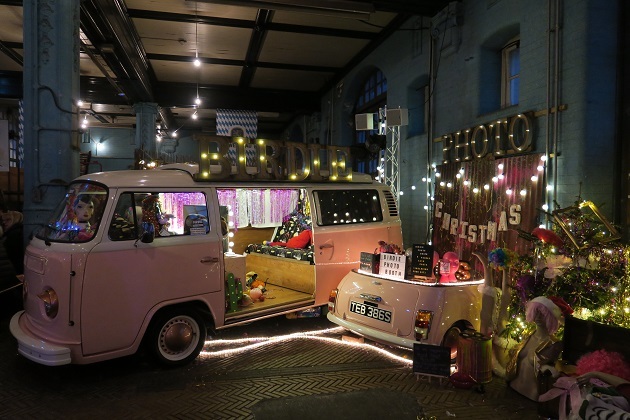 Husband discovered the beer hall type place which was oozing atmosphere and I just loved the pink VW camper van. This was the perfect spot to spend our last full afternoon of the holidays. 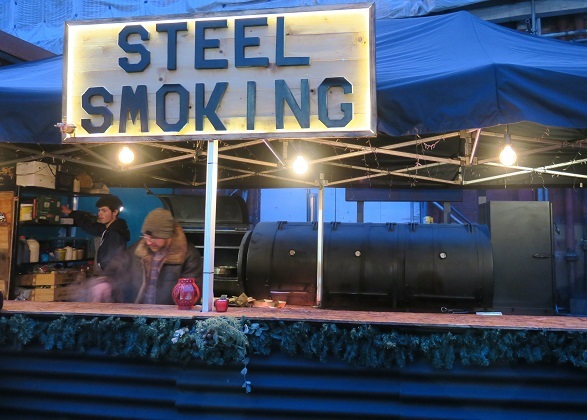 Your photos of The Winter Gathering are splendid, I really thought it was a great venue. 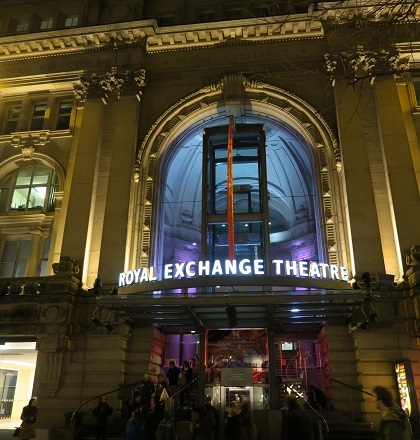 I also love the Royal Exchange theatre and have seen several performances there. It’s a unique building isn’t it – I love the old Stock Exchange detailing above the door and the good use of space. 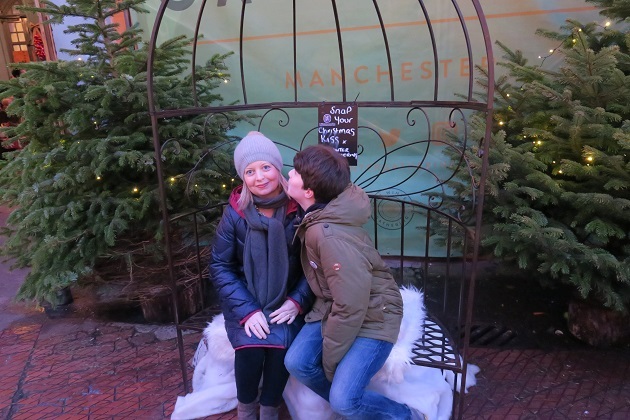 Lastly, the photo f your son and yourself together is so nice – it epitomises Christmas ! I’m surprised he posed like that -starting to get a bit self conscious!! 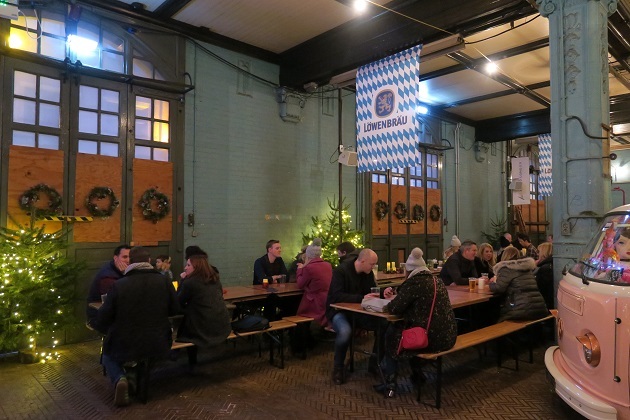 We just loved the atmosphere and everything about the Winter Gathering, I read you can do tours of the old fire station building so might investigate that as it sounds interesting. Ooh, a tour of the building would be interesting! A light covering of snow here this morning and pavements very slippery! We have no snow at all – much to my son’s disappointment!! He was hoping for a huge amount and a day off school I think. Still very chilly though. Looks great – I remember the Royal Exchange when it was quite new in the late 70s when such architecture (building within a building) was quite surprising. No idea what I saw and I’ve not been back in nearly 40 years. No slur on the theatre, I had a boyfriend who lived in Manchester back in the pre-John days. Seems like another life! He he Anabel – I can imagine!! The building in a building is something I never tire of and it’s really the theatre that is the draw for me not so much what’s on in there! It feels like an extra treat at Christmas too!! 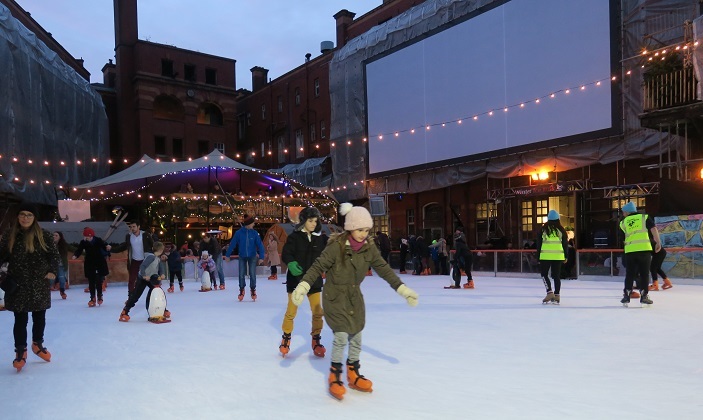 That sounds like a fun weekend – Manchester would be great for that, something for everyone! It’s such a lovely theatre isn’t it – we love going there, always a real treat. Great to hear the Royal Exchange is back in working order. When I was there in 2011 it was closed, having been badly damaged by the riots. We were away during those riots so didn’t experience any of that horrible stuff. The theatre is very much up and running thankfully. Bit of a dramatic history as it was badly damaged in a bomb in 1996 – it seems to always bounce back. I miss the winter holidays already. We still have snow piled up everywhere but it’s not as festive… your day looks like a perfect combination of culture, food and Christmas – those are the very best days to hold onto as we slog through the cold grey January slush! Me too Lara, the holidays just seemed to zoom past and were over before we knew it!! No snow here, my son is really disappointed – plenty of grey January days though!! It was so much fun and a gorgeous setting. 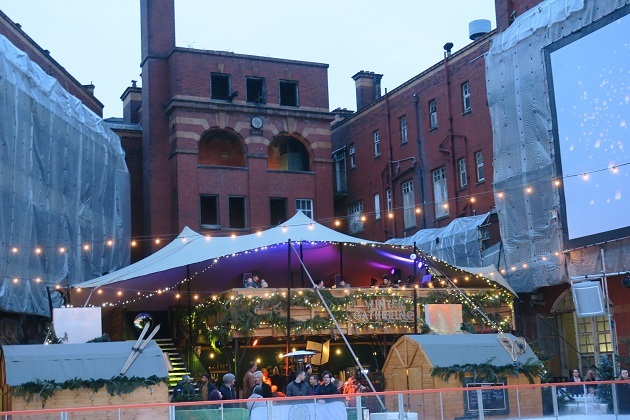 There is a good Christmas market and ice rink in Nottingham every year which gets my recommendation! Haven’t ever really been to Nottingham so good to have your recommendation Andrew!! One to think about for next year! 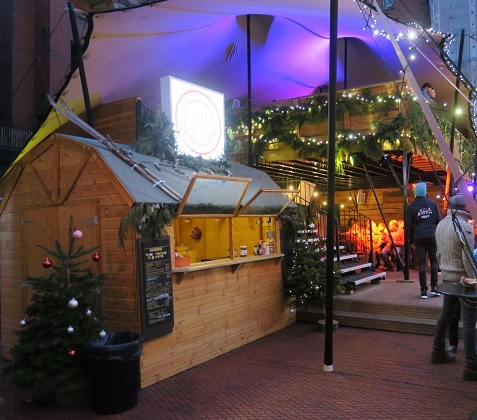 It is a good one, nice traditional German market ambience! well worth a visit. I love the photo of you both. 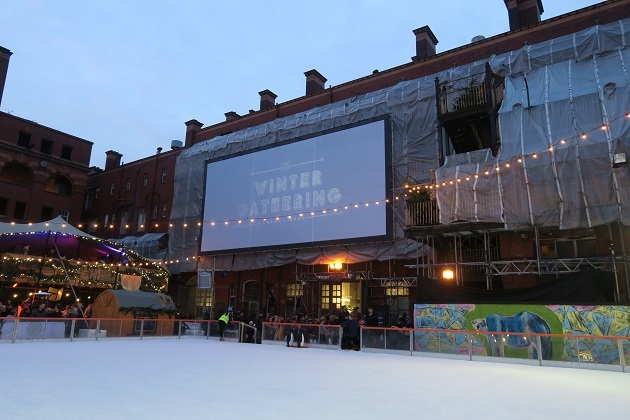 The atmosphere and the ice skating looks so brilliant and Christmassy – I’ve not heard of Winter Gathering. I want to go now! 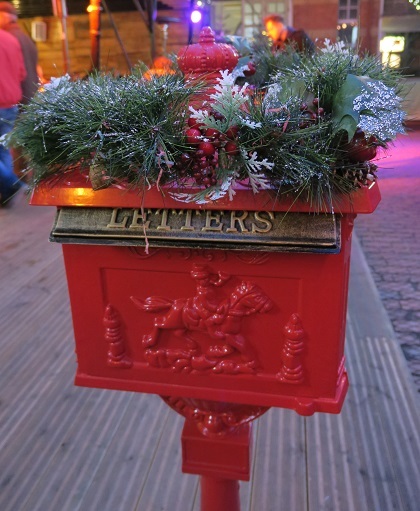 It was so much fun – a lovely atmosphere in the most magical setting…. perfect for Christmas. Thank you – it was a lovely afternoon. What a fun day during Christmas holidays…making memories…that is the best! Absolutely Pam – this was a day of great and fun memories. That reminds me, would be lovely to get around to go to the theatre more often! 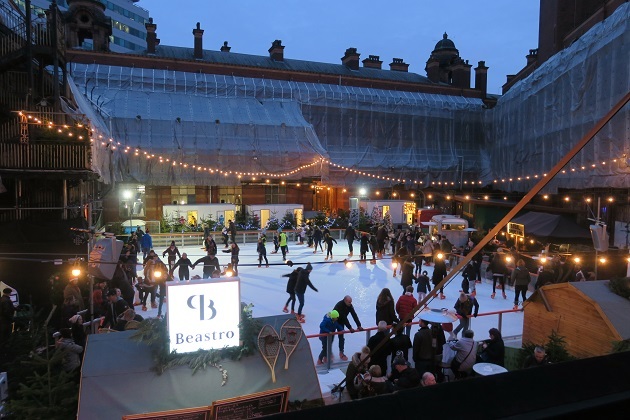 A lovely venue for Iceskating. You weren’t tempted to try too? Not this time…didn’t want to show ourselves up!! Hi, I think a lot of people have fond memories of their experiences with VW campervans. Absolutely Margaret – they’re just great! It was a really lovely day out Rosemary, a visit to the Royal Exchange is always a treat but we’d never been to the Winter Gathering before and didn’t know what to expect – it was just wonderful. They’ve been forecasting terrible weather – snow and floods but we’ve been lucky so far and not had anything untoward!! Hope your weekend is going well too. Yes I heard that bad weather was on the way Joy so glad it hasn’t reached you. Winter Wonderlands are lovely in theory but not always so great in practice! My dad said there had been a sprinkling of snow in Yorkshire (he’s in Harrogate) but it had all disappeared very quickly. Having a relaxing weekend as it’s quite warm but cooling down again by tomorrow (I prefer it not to be too hot but I probably shouldn’t say that!). Oh I love the xmas atmosphere with all the little lights and decorations 🙂 The Royal Exchange is a nice building. I love the last picture !! I’m surprised he did that in the picture – those moments are getting fewer now!! what a wonderful day and I love your photos. Felt like I was visiting as well. It was such a lovely day, something for everyone and a real spectacle.